Happy 60th birthday Sandra Post! Hey all you Crazy Golfing Canucks! Sandra Post turned 60 today! Can you believe it? Just last week she was at UBC giving a golf clinic for Jazz Golf. I wish I had known then…I’d have gone up and wished her a Happy B’day. 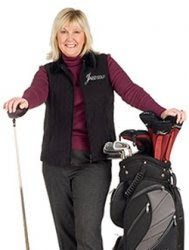 Actually, I had a tee time and couldn’t stick around anyway, but I wanted to thank her for creating a brand of clubs that new women golfers can hit well (Jazz was my first driver and I loved it – my husband kept calling me the “robot” because I kept hitting it so straight down the middle). I didn’t follow women’s golf much in Sandra’s day, but I wish I had watched her when she became the youngest player (at 20) to win the LPGA Championship defeating the great Kathy Whitworth in a playoff. Remember….Whitworth has won 81 LPGA tournaments, so that says something about Sandra’s game way back then. She was inducted into Canada’s Sports Hall of Fame in 1988 and the Canadian Golf Hall of Fame the same year. I didn’t realize she “retired” from pro play in her mid 30’s like Annika is about to do. I wonder if she regrets that a bit. Even with that short career, she won 9 LPGA Tour events. Maybe Annika should have a chat with her. The article below is a good one and worth reading. It says that Sandra enjoys teaching and works with golfers from 8 to 80. I played one day with one of her ex-students and she said she was really good – but really tough – no nonsense and no pansy with her students. Well, I expect Hank Haney and Butch Harmon aren’t pansies with their players either. I guess the great ones never are.